Cape Town Night Two – 28 January 2014 | Better days! Of course I knew what to expect of Bruce. Has he ever had a bad show in his life? The audience was much more jubilant and expectant than on Sunday night, even outside the gates. It was mostly international fans who got numbers and went for the pit, but even among them the atmosphere was filled with more excitement than the first night. I am sure many friendships had been formed or renewed among them. One also noticed quite a few reddish necks. Although it was cooler and cloudy the African sun still took its toll. Not that it seemed to bother anybody. One of the things that make me happy this week, is the lots of international fans who came out for the shows and seem to be enjoying Cape Town tremendously. On Sunday night the early birds right after the pit-goers queued quietly and calmly. Last night there was a subdued but determined shuffle to get in right after the guys getting in the pit. No stampede, but lots of energy and good-humoured maneuvering. Thanks to my twenty four year old non-fan companion (with his Dave Matthews T-shirt!) we made it to a good position and were able to get the same spot against the railing right outside the pit and – important – right on Bruce’s way to the little stage center front. And yes, I touched him again. Twice. 🙂 But graciously gave my place for two American fans to try after that. (They failed, but they were happy just for trying.) Me? I have never been so glad for being tall and having long arms! The almighty roar that went up the moment Bruce came onstage (again about 45 minutes late – perhaps because of the accident on the N1 which apparently delayed his arrival at the venue and thus the sound check) I will not forget easily. People were ready to party from the word go. Outside I have noticed several signs for No Surrender, one of my great favourites and symbolic of the way I try to live my life. After free Mandela (a choice that most people do not understand, because they are not familiar with Stevie’s campaign in the 80s) he immediately grabbed a sign and blew me away. After that Two hearts … after that … Well, you have seen the setlist. Lots and lots of different songs from the first night. Energy. Passion. Joy. Sweat, beer, emotion. I am no great fan of Spirit in the night, but it was a blast. As was the rest of the show. (Of course I am not being objective here. Who wants to be objective?) Crowd surfed right across the pit again. The landing seems to be a bit more difficult nowadays with Nils and Jake quickly coming in to support him, which I think is very wise. Kissed fewer women, I think. Spent quite some time with a group of girls with Courtney Cox photos used as masks. Danced with a lady who survived breast cancer and gave her so much close attention, it was just beautiful to see. Shouted Security! Security! when a girl slipped onstage near the end of the show. Made it sound like a joke, but I think they got the message that he does not want that to happen again. 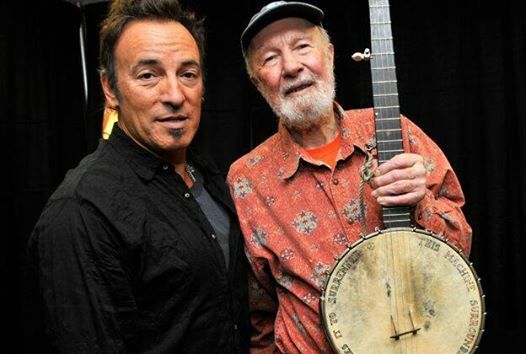 Bruce was jubilant and funny (again the routine of the SA arse sending the message to the SA brain) and energetic, but clearly sad when talking about Pete Seeger and what he stood for and singing a beautiful We shall overcome. He was also more serious than usual during BITUSA. Tenth Avenue was a blast, with the usual tribute to Clarence and Danny. Can’t remember the rest now. Have not counted how many changes there were from the first night. (Found out later there were fourteen new songs.) But it was a lot and he got it just right for me, finding a balance of repeat songs which make you feel you know what is going on, and new songs which give you the feeling just about anything could happen. Next to me stood a couple about my age (a few years younger than Bruce) who has been ripped off on the internet and paid R10 000 for their two tickets. 😦 I told them they will get their money’s worth. According to their faces they did. My feet don’t even hurt this morning. It was a great, great night and I am going heavy on the fluids to be ready for tonight. Now off to bed. (Lucky me, to work from home and being able to give myself this week’s holiday.) Still on such a high, can’t see how I will be able to catch a nap. This entry was tagged Badlands, Big Man, Bruce Springsteen, Darkness on the edge of town, E Street Band, High Hopes, music, rock, rock music, South Africa, The Boss. Bookmark the permalink.